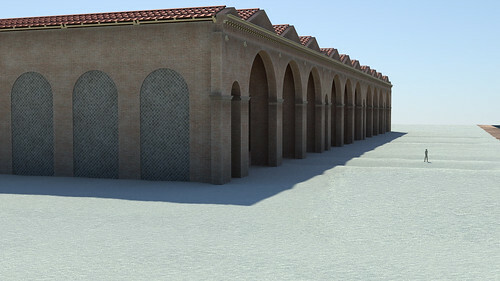 The Portus Project is employing computer graphics for four separate purposes. Firstly, these tools are being used as mechanisms to integrate the diverse spatial data gathered via our research. For example, we are combining three-dimensional geophysics with laser scans and excavated sections to understand the development of the Building 5. Secondly, computer graphics provide a means for developing interpretations of the data. At the corner of the surviving cistern complex (Palazzo Imperiale II) such simulation has helped us to understand how water may have been moved between the harbour buildings. Thirdly, they are being applied towards formal analysis of the site, for instance in terms of structural analysis, studies of lighting, and assessment of the use of space at the port. Fourthly, still, animated and interactive computer graphics are enabling the project to communicate its interpretations widely. In addition to creating these visuals, we are researching the role that visuals have played and continue to play in the representation of the site.